The First Amendment protects the right of Americans to associate privately with others. Nonprofits across America have long relied on this right to organize supporters and advocate on their behalf. Examples of such organizations include the National Federation of Independent Business, National Rifle Association, National Right to Life Committee, the AARP, NAACP – and virtually any group advocating for any cause. However, the ability of nonprofits to advocate for various public policies is being threatened. Under the guise of “transparency,” ethics, or “good government,” numerous state legislatures have considered constitutionally-dubious proposals to force these organizations to publicly expose their supporters’ names and home addresses. These anti-privacy and anti-free speech laws obstruct public debate by discouraging citizens from joining groups that speak about public policy. They also subject groups to complicated reporting requirements that raise costs, force many to hire lawyers, and inhibit grassroots advocacy. Laws targeting advocacy groups are distinct from those that require disclosure from groups primarily engaged in influencing elections, such as candidates, political parties, and political action committees. The first line of defense for free speech is the oath many legislators take to protect the Constitution. 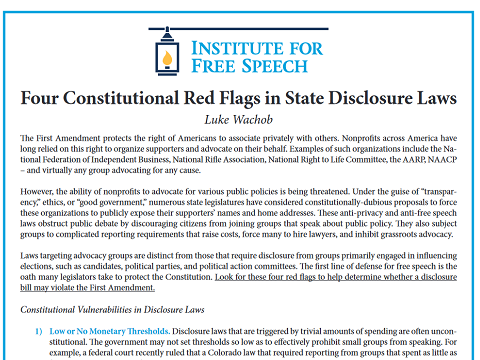 Look for these four red flags to help determine whether a disclosure bill may violate the First Amendment. 1) Low or No Monetary Thresholds. Disclosure laws that are triggered by trivial amounts of spending are often unconstitutional. The government may not set thresholds so low as to effectively prohibit small groups from speaking. For example, a federal court recently ruled that a Colorado law that required reporting from groups that spent as little as $200 was unconstitutional. 3) Vague or Broad Definitions of Regulated Speech. The government has an obligation to clearly define speech that triggers regulation. 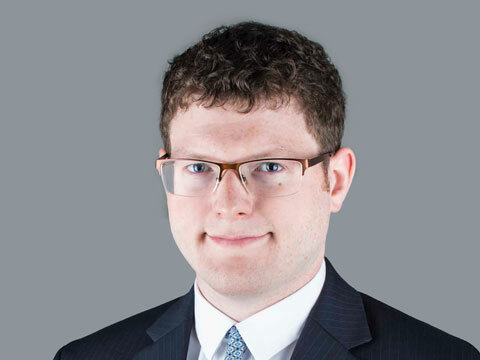 Groups have successfully challenged laws in Arizona (Galassini v. Fountain Hills) and Utah (Utah Taxpayers Association v. Cox) that chilled free speech by creating uncertainty about the reach of the law. Simply put, courts are likely to strike down laws when citizens can’t understand how to comply. 4) Disclosure Requirements for All or Most Donors to an Organization. Forcing groups that engage in a small amount of political speech to publish the identities of all their donors is excessive. These donors may have wished to support the organization’s general mission and not a particular position the group has taken. They may not support or even be aware of the group’s views on every issue. As a result, publicly exposing citizens’ contributions both misleads the public and violates their privacy – while potentially subjecting them to harassment and intimidation. Current law governing associational privacy is the product of over six decades of court rulings defining the limits of government’s power to force disclosure. Efforts to expand disclosure beyond what has been clearly sanctioned by the courts are likely to attract costly legal challenges. Disclosure laws should therefore be evaluated with an eye towards preserving freedom of speech, privacy in association, and a robust role for nonprofits in public debate.